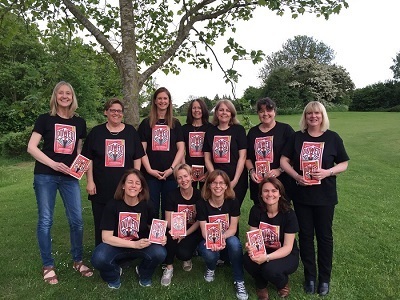 National Reading Group Day takes place on Saturday 16 June, in association with the Booksellers Association, and we think there could be no better time to celebrate reading groups in libraries, bookshops and communities around the country. We know that reading groups and book clubs play a vital part in people’s lives and reading journeys. In our big reading group survey, we found that being a member of a reading group makes you happier, widens your reading habits and helps you enjoy books even more! To celebrate this year, we asked for the best Books to Make You Laugh and Cry. We’ve had lots of suggestions, and you can download the final list, with readers’ comments, from our resources. What do you think of the list? Are there other books you would recommend? Comment below or let us know on social media using #NRGD18. We’d love for reading groups across the country to get involved and celebrate National Reading Group Day in their own way. Here are just a few ideas, you can add your own by leaving a comment below. 1. Show us what you love about your reading group and share what you are reading this month by posting a picture on Twitter, Facebook or Instagram using #NRGD18. 2. Visit your local library this weekend, and borrow a book. Take a look around and see what else they have to offer. Why not ask your local librarian their advice on what your group could read next? 3. Saturday is the start of Independent Bookshop Week, with over 400 indie bookshops taking part. Why not visit a local bookshop with your group, and take a look at the celebrations happening? You can share what you get up to using #IBW2018. 4. Join Reading Groups for Everyone and discover new books, prizes and exclusive offers. You can also sign up to receive our free monthly reading group newsletter, an easy way to hear about the latest news for reading groups. 5. Take a look at our Books to Make You Laugh and Cry list, review any titles you have read, and make suggestions of what other readers might enjoy.